see our range, which covers everything from Truckles to Jars, from 250g Stilton wedges, to half truckles, The Cheese and Wine Shop is the place to buy Stilton, which is Britain's historic blue cheese and Britain's favourite blue cheese! Stilton etiquette in England has long been a talking point at dinner parties across the land. Should you use a spoon or scoop? How should you slice the cheese, like a cake perhaps? One thing is for sure, you should never; repeat never, "Nose a Stilton". That's like keeping the rare roast beef for yourself and giving your guests the overdone stuff. Nosing the Stilton is stealing the moist centre whilst leaving the drier outside for your neighbour, which is a serious Stilton faux paux! Always cut a wedge into slivers lengthways to avoid nosing the cheese and potentially causing considerable offence. Many an argument has been caused this way. If eating half a Cropwell Bishop Stilton, the best way is to start slicing from around the edge of the cheese horizontally, like you're cutting around the cheese's belly, so the opposite of cutting a cake vertically. If one wants to use a spoon or scoop, then scoop a helping from the centre of the Stilton and place on your plate. You can use a knife and fork to eat your Stilton, or rest morsels of Stilton on a biscuit before eating with you're fingers, both are acceptable. Bread is a great alternative to biscuits. What should one pair with Cropwell Bishop Stilton? Port is excellent ( we recommend eating the cheese and drinking the Port separately), pudding wine is particularly enjoyable as well. Any full-bodied red, a Claret maybe? I find most alcoholic drinks in quantity work well. 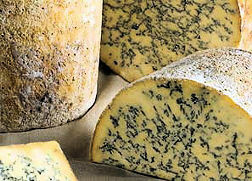 Try an Alsace, which has a little more sweetness to cut through the blue notes in the cheese. A sherry is very agreeable, namely Pedro Jimenez. There are many accompaniments to eat with Stilton; honey is popular, and we have a selection of Honeys especially for Cheese, see them under our Cheese Partners here.Any chutney or sweet jam works really well. Some people like quince cheese. Try it with walnuts and honey with a stick of celery, highly recommended!